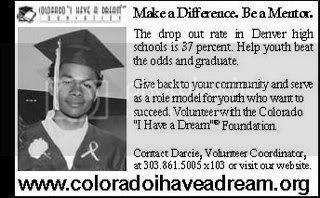 As an AmeriCorps*VISTA at Colorado "I Have a Dream"® Foundation, I served under the Volunteer Coordinator. I designed volunteer manuals, e-newsletters, and training and support information. I enhanced recruitment materials, creating/assembling packets and displays for events, distributing recruitment materials in Denver communities, researching media advertising, and placing advertisements online and in local print publications. I educated community members about the mission and activities of CIHAD at special events and supported volunteers at collaborative trainings. Additionally, I planned volunteer recognition events and gifts.